To everything there is a season . . . a time to say "yes" and a time to say "no." Okay, I'm taking some liberties with Ecclesiastes here. But learning when to say yes and when to say no has not always been easy for me. I'm still learning. 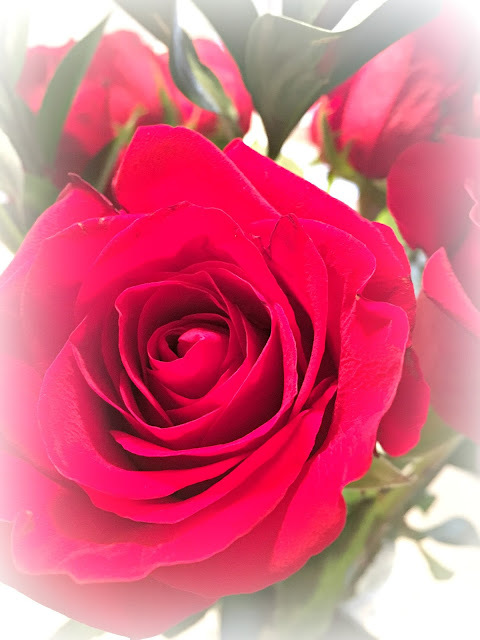 Valentine roses from Mr. Beautiful. Even though he's been sick, he still stopped to get me some. I used to say yes automatically to requests for my time or talent, wanting to be the "nice" girl, the "good" girl. I didn't think about such things as boundaries, or even whether I had the right to have boundaries. The "sure, I can do that" just came out of my mouth without any thought. So I would find myself doing things I didn't want to do, didn't need to do, or wasn't equipped to do, and, of course, ending up with a lot of stuffed-down resentment. I needed to remember that "not every need is a call." And then there have been other times, when out of selfishness or laziness or fear, that I've said no to things that looked hard or inconvenient but that would have been real blessings to me or to someone else had I just said yes. Just this week I had to say no to my book club. We were meeting at my house, and my husband wasn't feeling well. I knew it would be inconvenient for everyone to try and reschedule, and the "nice" girl in me didn't want to put others out. But I had to stop and think of my husband. Sure, he could have gone upstairs as he usually does when they come over, but how much nicer for him to be able to have a meal and relax in front of the fire with a hot drink? My being "nice" to others wouldn't have helped him. Besides that, I felt I was coming down with something, and there were lots of germs in the house! Then this morning I had to cancel a special one-on-one crochet tutoring class because now I'm sick. I didn't want to cancel last minute because the instructor scheduled the session just for me. I thought it wouldn't be "nice" to cancel. Of course, duh, it wouldn't be "nice" to spread germs and get her sick either. So I rescheduled, with apologies. Because I wasn't able to collect books that needed to be returned to the library from my friends Monday night at book club I was also going to drive around to their homes and collect them today. What? I'm sick and it's cold and snowy out. I had to tell myself no. A $6 dollar fine isn't going to break me. I can say no, and stay warm inside. These are just small examples of relatively easy choices to say no. There are much bigger choices that confront us. Do we take that volunteer position? Do we agree to serve on that committee? Do we continue a friendship with a toxic person just because we can't say no? Do we allow stronger personalities to steamroll us, convincing us to do things we don't agree with? I've gotten a lot better at boundaries. Now, almost every time someone asks me for something, I allow myself some time to consider it. I've trained myself to say "I'll get back to you." And I do. I just know my propensity to say yes and then regret it, so I give myself a little time. I've learned to be careful in my friendships and to go slow (that's a topic for a whole other post). It's a lot easier to avoid entanglements than to get out of them. How many times do I know I really need to do something and I shrink from it? Just recently a request came in for some help that was going to involve a two-day commitment on my part. Doing something I really didn't want to do. And yet, I knew it was the right thing. Praying that the Lord would give me a cheerful heart about it, I said yes. And wouldn't you know? I was so glad I did. I was blessed, and hopefully I blessed others. The discernment part is the hardest. When is it right to say yes? When is it right to say no? Because every situation and every person is different, I think we never have the answer to this question. Each and every time a request or opportunity or job comes our way we will be faced with this question. Sometimes it's easy. There is a time for a spontaneous yes or no! But if we haven't always responded to requests or situations with wisdom, and know our propensity to get it wrong at times, we need to carefully pray and listen, and not assume that our automatic reactions (yes or no) are right. How about you? Easy or hard? What?! Did I just say yes to making an afghan?! I may wish before this is over that I took my own advice. I do hope you and your hubby will soon be all well. 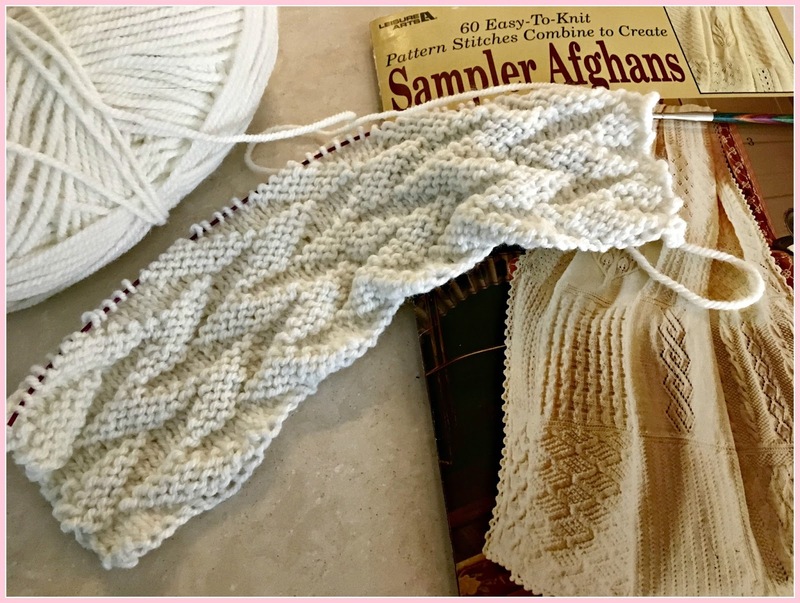 The afghan is a learning experience and you will have something lovely to show for it when you are done. Excellent thoughts on this subject, Deborah. Boy... your words could be my very own. All this week I have been down with some health issues of my own and for me to say no to some commitments hasn't been easy, but I'm sure glad I made some cancellations. I've actually rested, really rested, every day except on the day I hosted my Valentine's Tea. I just hated to post pone it, and I'm happy I didn't. Boundaries have been one of the hardest things for me to set, even after reading a book on boundaries years ago, but, I finally came to the place of seeing that it was needed and it has been one of the best things I have done for myself. Yes, I catch myself at times falling back to my old ways, but for my own good and my health I must stop and ponder on things first before just jumping right into something. Praying you and your husband will soon be feeling better. Enjoying resting! Yes, I hear what you're saying, I think. That is, if you are saying that just because something appeals does not mean that The Lord wants you to undertake it and vice versa. Personally, I find saying "no" very easy. I rarely say "yes" and have to fight with myself to ever say yes. There is definitely room for improvement, but I shall leave that to Him. I have zero powers of improvement. Your afghan looks very pretty...a lovely pattern. Such a wonderful phrase I will get back to you, I must remember that and try harder to say no. I like to please and that is not always the right thing to do. Your post gave me lots to think about. I love those pretty colors of your afghan too. And yes, I had a problem saying no when I was younger but not as much any more. Life does get complicated when you get involved in a lot of things but I think you're making a lot of good decisions. And I hope you and your husband feel lots better soon. Hugs! Deborah, you could very well be writing about me in this post. It has taken me a very long time to learn to say "no." Not good when you're in the ministry. Like you, I wanted to be the nice girl but nice girls get taken advantage of too many times. Of course now I can't do the things I used to do and I miss it. Hope you and your hubby feel better real soon. My hubby is coming down with that dreaded cold and I am praying I don't get it. I enjoy the subjects you write about. It's always fun to stop by. OH MY GOSH! You are ME! That is so me---taking things on whenever someone wanted me to--afraid of disappointing others often at the cost of disappointing myself. I am still not GOOD at saying No-but I do it now when I know it is not in the best interest of my family--or myself. I am the same way with friendships- in the past I have jumped in and found I jumped way too quick. I am very cautious now about forming new relationships...and, like you said, that is a post unto itself. Hi Deborah, So sorry you and your hubby are not feeling well. Well wishes for a prompt recovery!! I understand this post too well and learned after years of trying to please everyone that it's okay to say no. We just have to give ourselves permission to put our self first at times when the situation calls for it. It's not the end of the world I found out. Everything still fell into place even without me. haha So as hard as it was to reorg my brain, I did, and it's very freeing!! Wishing you fun with your afghan. Love the pretty design in that stitch!! Knowing when to say yes and when to say no used to be hard, but not so much any more. I've learned over the years to listen to what's in my heart and I am much clearer in knowing what I am to be about with my days, so unless I get a definite nudge from Him, I stick to that. Thanks for a lovely post and for sharing your own experiences with us. I hope you and hubby are well soon. Enjoy this 'getting well' time together. There is a lot of guilt in saying no, Deborah. This is really a post that we are all thinking about. Back when my kids were young and I was scattered, I had a better excuse to say no to certain obligations. Still--my dance card was full. Now I say...I've said my dues. 4 kids and countless activities, parties and sports events...I'll be happy to never do it again. And if I set boundaries with the grand kids ...well hate me! One thing I have learned from a very wise woman who counsels me, never be on the defensive (this works in chess, too, and I'm a champ). You don't need to explain 'why' when you say no. Nor be rude...simply say it "doesn't work" or you have "other obligations". Like sleep. For me? Hard! But it's getting easier to set those boundaries, with the help of the Mr. I think we're so naturally programmed at being Type E - everything to everybody - that it goes against our makeup to do otherwise. Like you, I have a commitment right now that I feel certain will bless me, yet I keep thinking what an inconvenience I feel right now, as I'm working through my kitchen project and trying to plan for that commitment too. I used to be so overly-committed that I often feel guilty for saying no now. What a conundrum. I sure hope you're feeling better Deborah, and your Mr. as well. Nothing like getting hit by the sick train when you feel all these commitments, right?? I think, like you Deborah, it has taken me years to figure out the "no" part. However, now I've taught myself to say...let me think about it first. Right now in my life, adding extra things can be too stressful. As far as friendships, I somehow have managed to have kind, wonderful, caring women in my life (you included! ), and that is a beautiful blessing from God, for which I am thankful. How thoughtful of you that you canceled your book club and your crochet tutorial. I hope you and your sweetie will feel better soon. Love and hugs are sent across the miles. Last year I attended an eye opening bible study group on 'boundaries' and learning to say no was a good part of it. If we give some thought to a request before declining, it can make a world of difference. This is really a great post Deborah...one that speaks to so many of us, as your comments seem to attest to. I would say I am more of a "no" person than a "yes" and it has made me feel very guilty at times. I have a friend who could never say no to anything that was asked of her and she became so overextended and stressed out it seemed to overshadow any good she was doing. When I am asked to do something, I rarely if ever give a yes answer right away...and then there are other times when I don't even hesitate for a second, it really sometimes just depends on what is being asked. I think you were very smart dealing with the yes/no situations that you had recently. I hope you and Mr. Beautiful will soon be feeling much better! I think your words show wisdom on this subject, and that is a great blessing. I like your use of the word " boundries" because that is really what it's about. So often we don't understand that we need to set limits so we don't wear ourselves out, and then are not available for the people we are truly called to help. I hope wellness returns to your home soon! Take care! I used to automatically say yes to things for the same reason. I wanted people to think that I was nice and always willing to help out. What I found out is that people start to take advantage of someone who always says "yes". When we always say yes to something, we get burned out, overwhelmed and disappointed. We can't do the things we need to do and find ourselves in positions we don't need or want to be in. Stepping back, praying about it and thinking it over are always the right things to do! Great post! Deborah, another thought-provoking and well-written post. Boundaries and discernment seem to be things that take us (esp. women) years to learn. When I reflect on all of the activities I was involved in (both my own and my childrens' and husband's), I honestly can't imagine how I did it. And I don't want to do it again! Finally, I am getting some wisdom in this area. I do a few things every week that require commitment and effort on my part, but I know they are a good investment of my time so I am glad to do them. It is very empowering to realize that I can say "no" if that is what is right for me at that time. Please do write about discernment in friendships. I have probably passed up a few people that should have become closer friends while becoming entangled with others that shouldn't have been. Take care and hope you and your husband are well soon. Wow, love the end photo and you are an excellent knitter! But to those questions, yes we have to think any request over with and in depth as it has an impact on our lives and on that around us. Like you used the example of your husband being under the weather for declining an event at your home. Wisely! For the very same reason I had to decline a request from Penn State University at that time to become their partner for covering the USA, Canada and South America. I was thrilled at the thought and very honored personally. Yes, I'd been a partner at several Technology Transfer Seminars in Canada and it worked fabulous. So did Pieter, he worked with them too. BUT, knowing that my dear husband is almost 22 years my senior kept me back and I declined. What if he has problems with aging and what if he gets sick and I'm traveling all week, solving other companies' problems?! Sure enough Pieter had his heart attack, without any warning signs and he needed quadruple bypass and a stent in his neck. So proud for having declined, and no it is not always about money. What can money buy? No husband and no life back; that's for sure. Talking about continuing with a toxic relationship, that too has to be dealt with as it affects our general health and well being and that of those around us. Thus I learned that due to some very toxic people, Pieter is getting heart cramps and lately he developed heart murmur. It is teaching me at a rapid pace, yes so to speak ahead of my age, to sort things out careful and to keep a smooth and happy sailing for the ones that are most important! Discarding all the negativity and heavy burdens early on can avoid a lot of problems. Age is teaching us all a lesson as we learn the hard way and it is impossible to please everyone! now the sick / flu part of this reminded me of a christmas long ago. I always had to host it. I had the flu...we'd all had it. Just days before, sort of recovered, I perserved on...made all the food, etc. Every single family member and guest ( grandmas, aunts, uncles etc ) came down with it after that. A great post on the importance of finding the balance of saying yes and no. "I needed to remember that "not every need is a call." LOVED that line, my friend! I sincerely hope you are feeling better! Hugs to you! I could certainly have used this advice when I my children were young. I'm afraid I said yes to too many PTA requests. I'm very glad I was always available for room mother, driving classes to field trips, Brownie mom, etc., anything where I was with the kids, but there were other times when I should have stayed home and cooked a good dinner for them instead of going to school board meetings. Good for you, taking care of your husband and yourself! As I read this blog, I felt like you were talking about me. I too am guilty of saying 'yes' or 'no' without thinking or praying about it or, if it's 'right' for me. I will now in the future try and think before I answer. Thank you for this informative blog post.